Music major Maddie Taylor seems to have her life all figured out. She's just finished her junior year of college, has a summer internship lined up with the LA Philharmonic, and plans to go to grad school to write movie scores. Only her roommates know she practices guitar every night and secretly dreams of a louder life. But geeky girls like her don't get to be rock stars. Tattooed singer Jared Cross has a new girl every week, but when he catches Maddie playing one of his songs, she attracts his attention in an unexpected way. His band needs a fourth member for The Sound, a reality TV show competition—and he wants her. Though Maddie refuses to be another notch on Jared's bedpost, she agrees to risk everything for the chance to be a rock star. Once on the show, Maddie discovers there's more to Jared behind his flirty smile, and with each performance their attraction becomes impossible to ignore. When the show pressures Jared to flaunt his player image, they're forced to keep their relationship secret, but Maddie can't help but want something real. 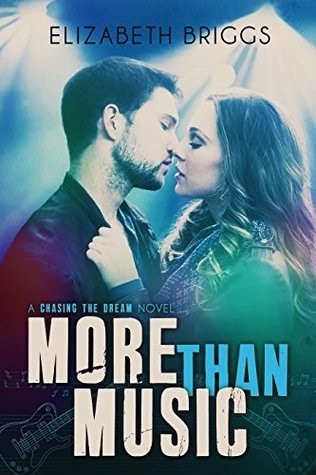 As the competition heats up, Jared will do whatever it takes for his band to win, and Maddie must decide if following her dream is worth losing her heart. After reading the prequel, I was left with a big desire to see how things would develop with the band. Alright, what I needed the most perhaps was to find out everything possible about Jared, but this book offered much more than that, and now Villain Complex has officially a new fan! I admit I've never been into reality TV shows much and I rarely watch them, but I had a blast reading about the one in here. Briggs gave such a vivid description of the 'game' and its dynamics that I couldn't help but being invested in the story. I cheered, cried and exulted with the main characters at every contest, and I was awestruck by their passion, which also played its explosive part in Jared and Maddie's relationship. I really loved their chemistry and how it developed into something deeper, but the reality certainly put some obstacles to their happiness... Of course, mistakes and misunderstandings just spiced up the read even more and the result was an unputdownable book! With its geeky references (a favourite of mine! ), lots of great music to accompany the journey and believable, great characters, "More Than Music" is a pleasure to read. Well done, Elizabeth Briggs!